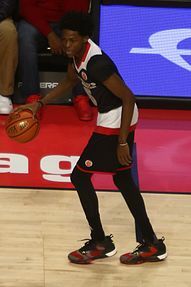 De'Aaron Fox (born December 20, 1997) is an American professional basketball player for the Sacramento Kings of the National Basketball Association (NBA). Fox played one season of college basketball for the Kentucky Wildcats, and was drafted fifth overall by the Kings in the 2017 NBA Draft. He committed to Kentucky on November 12, 2015 live on ESPNU. He chose Kentucky over Kansas, Louisville, and LSU. Fox attended Cypress Lakes High School in Cypress, Texas. In January 2016, Fox was named a McDonald's All-American and played in the 2016 McDonald's All-American Game on March 30. In April, Fox played in the 2016 Jordan Brand Classic, leading the East team to a 131-117 win while earning Co-MVP honors alongside Kentucky teammate Malik Monk. Fox then competed at the Nike Hoop Summit Games. He made the 2015-16 USA Men's Basketball Men's Junior Team in September 2015. He was also invited to the NBPA Top 100 camp. Throughout his high school career, Fox led Cypress Lakes to three state playoff appearances including a regional final appearance his senior year, and twice scored 50 points in a single game. Fox was the nation's second best point guard behind Lonzo Ball. He was ranked the consensus No. 6 overall player in the Class of 2016 by the four main recruiting services Rivals, ESPN, Scout, and 24/7 Sports. "Kentucky 2016 Basketball Commitments". Rivals.com. Retrieved August 20, 2015. "2016 Kentucky Basketball Commits". Scout.com. Retrieved August 20, 2015. "ESPN". ESPN.com. Retrieved August 20, 2015. "Scout.com Team Recruiting Rankings". Scout.com. Retrieved August 20, 2015. "2016 Team Ranking". Rivals.com. Retrieved August 20, 2015. On November 12, 2015 Fox committed to the University of Kentucky to play college basketball for head coach John Calipari. On November 13, 2016, Fox scored 21 points and 3 assists in a 93-69 victory over the Canisius College in the Bluegrass Showcase. On November 20, 2016, Fox recorded 16 points and 6 assists to defeat Duquesne University 93-69. On November 28, 2016 against Arizona State, De'Aaron Fox put up a triple double with 14 points, 11 rebounds, and 10 assists. This made Fox only the second Wildcat in the history of Kentucky Basketball to record a triple double after Chris Mills in 1988. On January 7, 2017, Fox scored 27 points and 6 assists in a 97-71 victory over Arkansas. On January 17, 2017, Fox poured in 21 points and 5 assists defeating Mississippi State 88-81. On February 18, 2017, Fox scored 16 points and dished out 5 assists to help the Wildcats defeat the Georgia Bulldogs. On March 4, 2017, Fox scored 19 points in a 71-63 win over Texas A&M. Kentucky would go on to defeat Georgia in the quarterfinals and Alabama in the semi-finals. On March 12, 2017, Fox scored 18 points in an 82-65 win over Arkansas in the SEC Tournament in addition earning SEC Tournament MVP honors. On March 17, 2017, Fox scored 19 points and 3 assists to defeat Northern Kentucky University in the First round of the NCAA Tournament. On March 19, 2017, Fox scored 14 points to defeat Wichita State 65-62 in the second round of the NCAA Tournament. On March 24, 2017, In a Sweet 16 matchup against the UCLA Bruins, Fox scored 39 points to advance the Kentucky Wildcats to the Elite Eight game. On March 26, 2017, Fox only scored 13 points in a 75-73 loss to the North Carolina Tar Heels. At the conclusion of his freshman season, Fox announced that he would forgo his final three years of collegiate eligibility and enter the 2017 NBA draft. 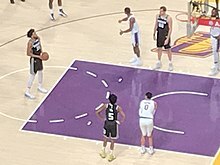 Fox (#5) watching teammate Marvin Bagley III take a free throw in March 2019. On June 22, 2017, Fox was selected with the fifth overall pick in the 2017 NBA draft by the Sacramento Kings. On July 8, 2017, he signed his rookie scale contract with the Kings. During four games of the 2017 NBA Summer League, Fox averaged 11.8 points, 3 assists and 2.3 steals while playing 21.3 minutes per game. Fox made his NBA debut for the Kings in their season opener on October 18, 2017, against the Houston Rockets, where he scored 14 points, 4 rebounds, and 5 assist in 24-plus minutes in a 105-100 loss. On October 23, 2017, Fox recorded a career-high 19 points, 4 assist, 5 rebounds, and 3 steals in a 117-115 loss against the Phoenix Suns. On December 8, 2017, he scored 14 points, 4 assist and 2 steals in a 116-109 win against the New Orleans Pelicans. On January 6, 2018, Fox recorded 18 points and 7 assist in a 106-98 victory over the Denver Nuggets. On January 25, 2018, Fox scored 14 points, 4 assist and a putback Slam Dunk with 3.3 seconds left giving the Sacramento Kings the lead in an 89-88 win over the Miami Heat. On January 28, 2018, Fox scored a season-high 26 points, going 6-6 from three-point range in a 15-point loss to the San Antonio Spurs. On February 14, Fox was named Lonzo Ball's replacement for the Rising Stars Challenge. On November 1, 2018, during a 146-115 win over the Atlanta Hawks, Fox notched his first career triple-double with 31 points, 10 rebounds, and 15 assists to bring the Kings to a 6-3 record, becoming the only player after LeBron James in 2005 to score a 30-point triple double before the age of 21. Fox was born to his parents Aaron and Lorainne Harris-Fox and has one brother named Quentin Fox. Fox goes by the nicknames “Fox”, "Vegeta", “Swipa”, and “Swipa da Fox”. Fox chose the number zero at Kentucky because he “fears no one”, giving his original number five to teammate Malik Monk. According to his high school coach, Fox would come to school at 6 AM and come to practice in the gym every morning. Fox would sleep on the couch almost every night and play the NBA 2K video game series. This, according to his father, is one of the reasons he's developed into the player that he is today. Fox is a noted fan of the hit Anime and Manga series Dragon Ball Z, with his favorite character being Vegeta. ^ "Point guard De'Aaron Fox, No. 7 in ESPN 100, chooses Kentucky". ESPN.com. November 12, 2015. Retrieved March 30, 2018. ^ "De'aaron Fox". 247 Sports. 247 Sports. Retrieved March 30, 2018. ^ "Fox, Monk share MVP honors at 2016 Jordan Brand Classic". USA Today HSS. April 15, 2016. Retrieved March 30, 2018. ^ a b "De' Aaron Fox bio". Retrieved March 30, 2018. ^ "Kentucky Men's Basketball Signs Six in Fall Signing Period". WLEX-TV. NBC. November 19, 2014. Retrieved March 30, 2018. ^ De'Aaron Fox ESPN. Retrieved March 30, 2018. ^ Kyle Tucker (November 29, 2016). "Kentucky Basketball: De'Aaron Fox records the storied program's elusive second triple-double". seccountry.com. Retrieved March 30, 2018. ^ Rosenberg, Michael (March 25, 2017). "De'Aaron Fox gets best of Lonzo Ball as Kentucky advances to Elite Eight". Sports Illustrated. Retrieved March 30, 2018. ^ Kyle Boone (April 3, 2017). "NBA Draft 2017: Kentucky's De'Aaron Fox will go pro, sign with an agent". CBS Sports. CBS. Retrieved March 30, 2018. ^ "Kings sign #5 overall pick De'Aaron Fox". Www.NBA.com. July 8, 2017. Retrieved March 30, 2018. ^ Voisin, Ailene (October 19, 2017). "De'Aaron Fox stole the show in NBA debut". Lexington Herald-Leader. Retrieved March 30, 2018. ^ "Sacramento Kings at San Antonio Spurs Box Score, January 28, 2018". Retrieved May 27, 2018. ^ Reid Forgrave (February 28, 2017). "NBA Draft 2017: HOW KENTUCKY PG DE'AARON FOX IS TEACHING HIMSELF TO THINK HOOPS AT AN NBA LEVEL". Bleacher Report. Retrieved March 30, 2018. ^ "Bruh y'all go foul out with all that reaching smh everyone that knows me knows I'm a Vegeta fan". Twitter. Retrieved March 30, 2018. Wikimedia Commons has media related to De'Aaron Fox. "De'Aaron Fox's Journey to the NBA". Sacramento Kings. July 26, 2018 – via YouTube.